A 20-something had sudden severe chest pain while smoking marijuana at a party. After approximately 40 minutes, other people there convinced him to call 911. The patient told the medics that he had had this pain on other occasions and it is because of an "enlarged heart." He denied SOB, N/V, or other recent illness. His vitals signs were relatively normal. 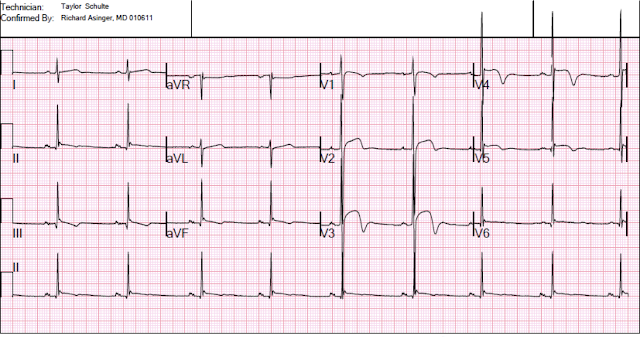 The medics recorded a prehospital ECG which could not be found, but they activated the cath lab based on that ECG. On arrival, the patient was very agitated and would not allow any IVs or blood draws. He stated he had a history of pericarditis and that this feels similar. There is very high voltage. 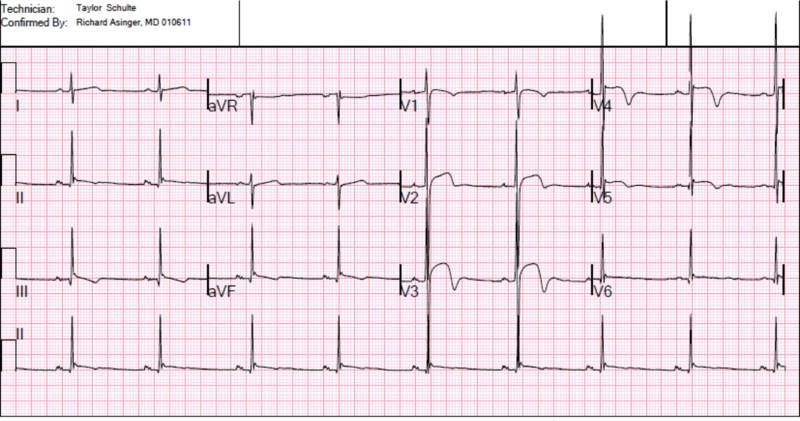 There is strange ST elevation in inferior leads which is not generally seen in STEMI. I was shown this ECG in a conference, with no knowledge of the outcome. I asked if the patient was thin and athletic. The answer was yes. Such high voltage in a 20-something is common in thin athletes. There is also a large R-wave in V1, which is suggestive of hypertrophic cardiomyopathy (HOCM). 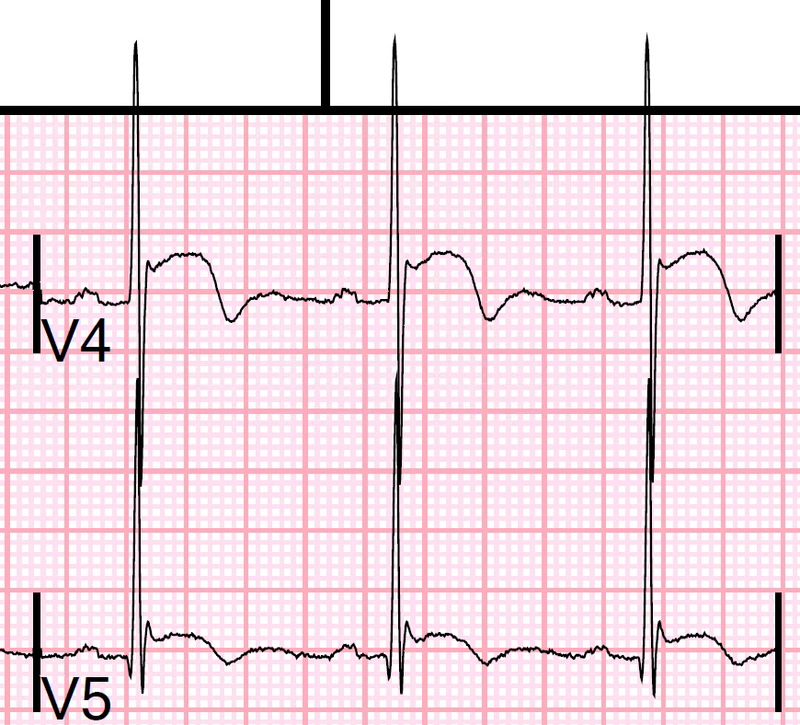 The physicians recognized that this was false positive ST Elevation due to LVH. They de-activated the cath lab. A Point of Care Cardiac Ultrasound was normal. He was taken out of the critical care area and remained anxious, hyperventilating, and diaphoretic. Obviously, ST Elevation like this must be take seriously. But it should also be remembered that very high voltage (abnormal depolarization) can have very strange ST-T waves (repolarization). And these can be dynamic. When I was shown this in conference, I said: "This is not due to a coronary event." Mostly, I just recognize this morphology as typical of LVH or Benign T-wave Inversion (even with its dynamic changes) and atypical of LAD occlusion. 1. There is massive voltage: lead V2 has 55 mm of voltage. There is high voltage, a distinct (though small) J-wave in V4, a prominent J-wave in V5, with ST elevation that turns down to T-wave inversion in a very particular way. Changes like this in the setting of LVH can happen from stress, takotsubo stress cardiomyopathy, drugs, elevated blood pressure or any number of non-ACS etiologies. If I were caring for this patient, I would get an emergent formal echocardiogram. That does, of course, require IV bubble contrast, which requires an IV. Not inappropriately, the physicians activated the cath lab. It was complicated because of patient unwillingness to agree with the plan. He still had not allowed any blood (i.e., troponin) to be drawn. My opinion was that this was still typical of LVH and unlikely to be due to LAD occlusion. The patient refused further workup, including an MRI of the heart. 2. 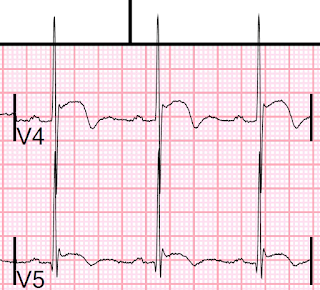 Electrocardiographic LVH can have dynamically abnormal ST elevation and T-wave inversion. 8 year-old with report of "syncope and an abnormal ECG". Great case! The 2nd and 3rd EKG of this case made me think of spontaneous reperfusion (e.g. evolving reperfusion waves / autolysis). You didn't mention these similarities; how did you differentiate between dynamically abnormal ST elevation with T-wave inversion and reperfusion, based on these EKG's? Did reperfusion cross your mind? Greetings and keep the cases coming, I admire your work. 2. I recognize this as a non-ACS pattern. Weakness and Hypotension, with Bradycardia.